Winging you way from PDX to warm sun and spring break fun? TriMet buses and trains are now teaming up to get you to Portland International Airport 24 hours a day, and save you parking costs. TriMet’s MAX Red Line is a cost-effective, easy way to get to PDX, providing direct service to and from the terminal. Trains run about every 15 minutes most of the day with service starting at 3:28 a.m. at Beaverton Transit Center. The first train arrives at PDX at 4:40 a.m. New to spring break, our Line 272-PDX Night Bus serves PDX between about 2 a.m. and 4 a.m., when the Red Line isn’t running, creating a 24-hour connection to and from the airport. It connects you with our Line 20-Burnside/Stark bus line that now also offers 24-hour service between Gresham and Beaverton. Both bus lines operate every hour so check schedules and plan ahead before traveling. The last train from Beaverton Transit Center to PDX now leaves Beaverton at 10:51 p.m.
Later trips from the Rose Quarter Transit Center to PDX now depart at 11:55 p.m., 12:25 a.m. and 12:55 a.m. The last train from PDX to Beaverton Transit Center now leaves the airport at 12:26 a.m.
Later trips from PDX to Gateway Transit Center now depart at 12:56 a.m., 1:26 a.m. and 1:41 a.m.
TriMet’s Line 272-PDX Night Bus serves PDX between about 2 a.m. and 4 a.m. when the Red Line isn’t running. The savings add up fast when you take transit to PDX. At $12 a day, airport economy parking will cost you $60 for a five-day trip, and that’s before adding the cost of gas. 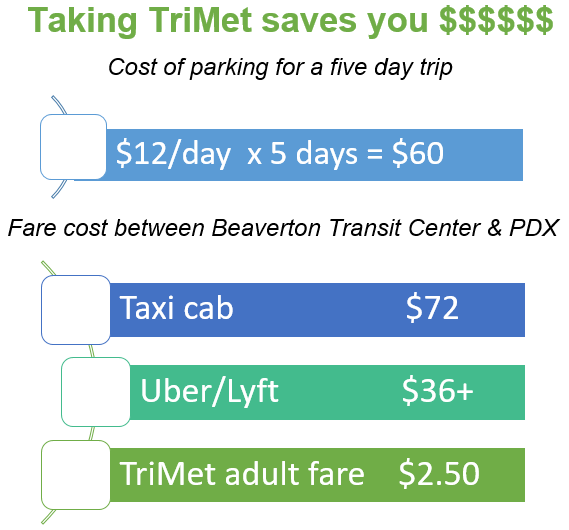 Also, it costs between $36 and $72 for one way rideshare and cab fare to PDX from Beaverton Transit Center. Adult fare on TriMet costs only $2.50 to get you to PDX from anywhere in our system, and the same to get you home. If bus and train alone don’t complete your trip, check out this new trip planning tool we’re testing. It brings transit and Uber together by using real-time locations of vehicles to plan a single trip using a mix of travel options. If the planned trip includes Uber, the tool links you to the Uber app so you can easily book and pay that part of the trip. If flying is not on your spring break itinerary, and you’re taking Amtrak or Greyhound instead, TriMet can get you there too. MAX Green, Orange and Yellow lines, as well as various TriMet bus lines, serve Amtrak’s Union Station and the Greyhound Bus Terminal. 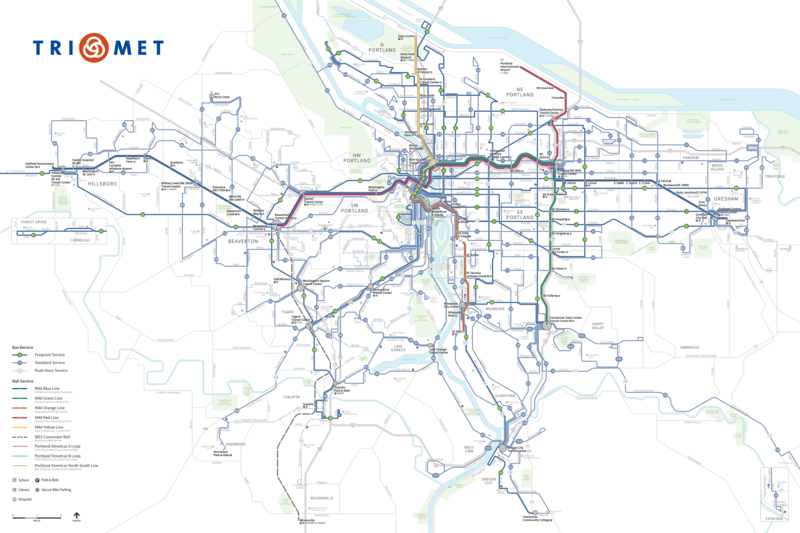 Maps and schedules show you where TriMet buses and MAX trains travel. TripPlanner has step-by-step instructions to and from destinations across TriMet’s service area. Fares are required on all TriMet vehicles and paying is easy. 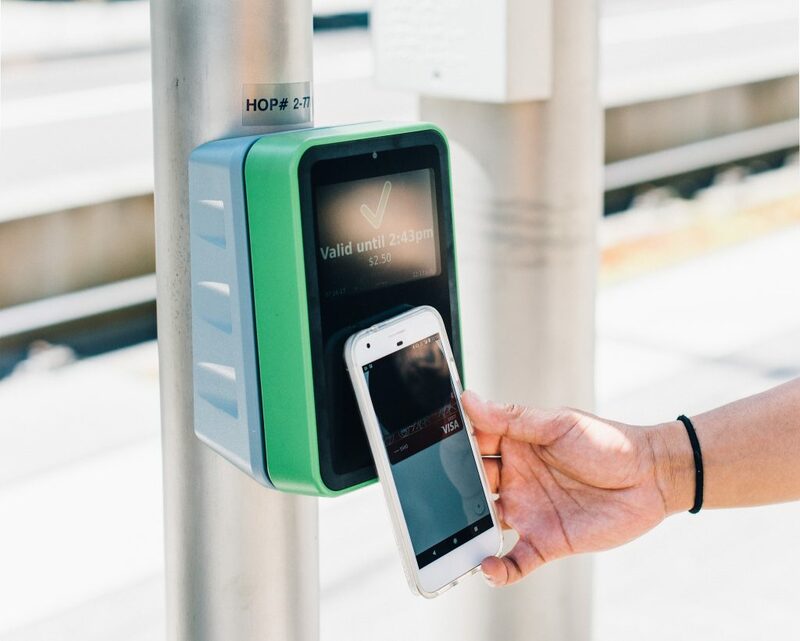 Options include paying with your phone, purchasing a Hop card and loading value on it or using our self-service ticket machines that are located at rail stations. You can buy a 2½-Hour Ticket or 1-Day Pass on the bus using cash. Just insert coins or bills (exact change only) into the farebox when you board. Note: Operators cannot give change. Adult fare is $2.50 for a 2½-Hour Ticket and $5 for a 1-Day Pass. Day passes for youth (ages 7-17) and honored citizens (ages 65+) cost $2.50, and children six years and under ride free. Need help planning your trip? Our Rider Support team is available 24 hours a day, seven days a week via text message at 503-238-7433 and on Twitter at @trimethelp. You can also call them daily between 7:30 a.m. and 5:30 p.m. at 503-238-RIDE (7433), or reach them online at support.trimet.org. More than 12,000 trips are taken each week to and from Portland International Airport on TriMet’s MAX Red Line. It was the first train-to-plane connection on the West Coast. 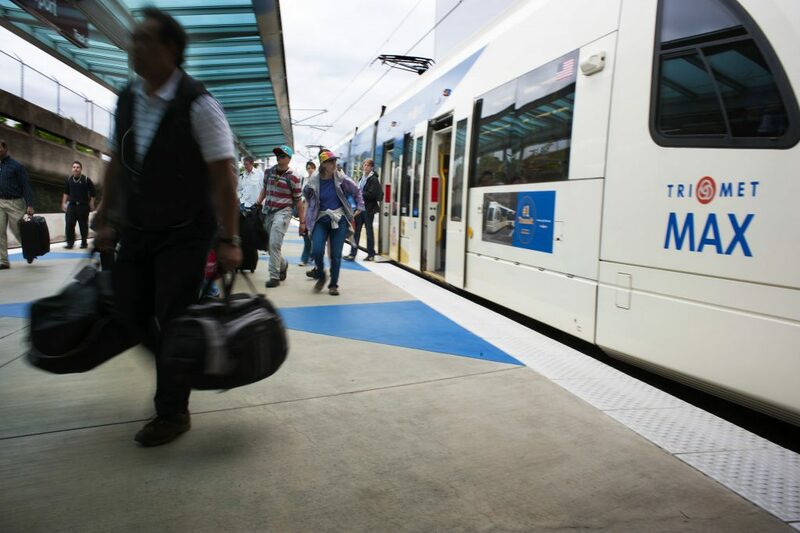 The Red Line serves more than 20 stations between Beaverton and the airport. Transfer between the Red Line and other MAX or bus lines at Pioneer Courthouse Square, Rose Quarter Transit Center, Gateway Transit Center or other stations.